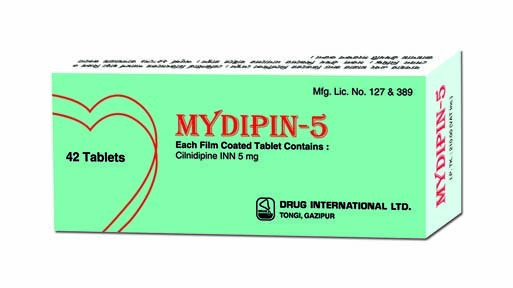 MYDIPIN 5: Each film-coated tablet contains Cilnidipine INN 5 mg.
MYDIPIN 10: Each film-coated tablet contains Cilnidipine INN 10 mg. Dosage & administration: The recommended adult oral dosage of Cilnidipine is 5-10 mg once daily. The dosage can be increased up to 20 in a day, if needed.Or, as directed by the registered physician. Use in pregnancy & lactation: No specific information about USFDA pregnancy category. Caution should be exercised during Cilnidipine use in pregnancy. Nursing mothers should consult a physician before taking Cilnidipine. MYDIPIN 5: Each box contains 3 x 14's tablets in blister pack. 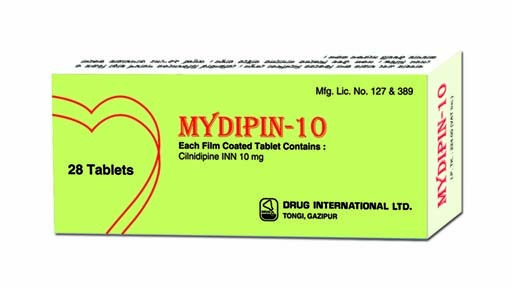 MYDIPIN 10: Each box contains 2 x 14's tablets in blister pack.